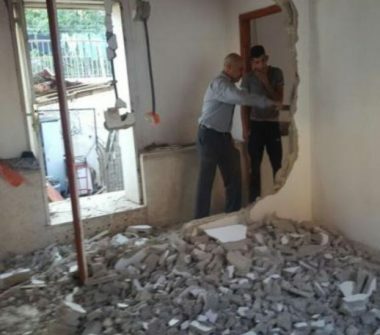 The Wadi Hilweh Information Center in Silwan (Silwanic), in occupied Jerusalem, has reported that a Palestinian citizen of the town had to demolish his own home, Saturday, to avoid excessively high fines by the City Council, under the pretext of being built without a permit. Silwanic stated that the city council informed the home’s owner, Ishaq Shweiki, that he would have to pay up to $17.000, in addition to other high fees, unless he demolishes his own home. The Palestinian chose to demolish the property because he wanted to avoid the high fines, but mostly to avoid the demolition of his entire building, which was constructed more than 100 years ago, especially since the home the city ordered him to demolish was later built on the second floor. The WAFA Palestinian News Agency said Shweiki was given 30 days to implement the decision to demolish the property under the pretext of building without permission. WAFA added that the second floor, only 50 square meters, was added to the building six years ago to accommodate the needs of his growing family. Palestinians in Jerusalem largely have no other options but to build without a permit, especially since construction permits are extremely difficult, and nearly impossible to obtain, in addition to costing in many cases more than the construction itself. Meanwhile, the right-wing mayor of the occupied city, Nir Barkat and his city council members, attempt to keep the city’s indigenous Palestinian population at a bare minimum while significantly increasing the numbers of colonialist settlers, by approving the construction of thousands of new housing units in Jewish-only colonies, built on illegally confiscated Palestinian lands, in direct violation of International Law and the Fourth Geneva Convention. The Israeli Information Center for Human Rights in the Occupied Territories (B’Tselem) has reported, on March 8, 2018, that Israel has demolished 13 housing units since the beginning of this year, rendering 19 Palestinians, including nine children, homeless. It added that, from January 2016 through 28 Feb. 2018, Israeli authorities demolished 104 non-residential structures in East Jerusalem (including fences, storerooms, farming buildings, businesses and a mosque).